A Big Fat HG Heads Up!!!! Warning!!! Think twice about eating anything made by Nutritious Creations. The company, which distributes its products all over NYC, to select diet stores nationwide, and online, was recently outed by CBS news in New York. Some of Nutritious Creations' now infamous s'mores brownies, peanut butter brownies, blondies and more, were tested by CBS and found to have more than TWICE as many calories as the labels claim. The worst offender being Nutritious Creations' blondie, which, when tested, contained a whopping 343 calories, instead of 143! FYI, that same news story also skewered a product called Scotto's Biscotti for similar mislabeling practices. Yikes. And do everyone a favor...spread the word. It's a very sad day in Hungry Girl-land whenever we have to report that something healthy has been pulled from any fast food menu. But we are especially sad to tell you that Wendy's has yanked its fantastic fruit bowl and fruit cup from its menu. When we called to find out why the chain chose to stop offering fruit, the answer was plain and simple. It wasn't selling. Restaurants were forced to throw dozens of pounds of fresh fruit away every night. Lesson learned here. Start ordering healthy items at your favorite fast food joints, people, or soon ALL of the healthy options will go away forever. A Complete Thanksgiving Dinner With No Calories! 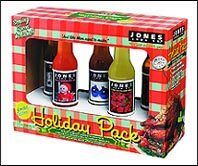 Jones Soda Holiday Pack is Back! If you're the kind of person who gets excited about disgusting yet interesting foods, you may already be a fan of Jones Soda Co.'s Holiday Packs. The fun 'n quirky soft drink company is famous for selling wacky holiday-ish, repulsively-flavored sodas (in cute collectible boxes) that sell out and become instant classics! This year, Jones is offering up two options -- a regional pack (sold at local stores) and a national pack (sold at Target). In them are sodas flavored like Turkey & Gravy, Cranberry Sauce, Broccoli Casserole, Corn on the Cob, Smoked Salmon Pate and more. Ew. Keep in mind, these beverages are completely calorie-free. Not that any sane human would actually drink them. Subway fans...guess what!? The chain is now offering "Veggie Provelone Slices" -- it's a happy day for fast food-loving vegetarians! ***Heads Up! It's Thanksgiving week, but did you know that the average Thanksgiving meal contains 3,000 calories and 229 grams of fat. A 160 lb. person would have to walk 30 miles to burn that off. Eeek! What does Oprah say is her "biggest, fattest mistake"? Her 1988 liquid diet. The talk show host says she starved herself for 4 months to fit into her size 10 Calvins but two hours after the show, she started eating to celebrate and two days later those pants didn't fit. We all live and learn. That's all we've got. HG out! Only a few more days left 'til Thanksgiving. Don't forget to make HG's Rockin' Lean Bean Casserole! Share this news with humans you like...Click "send to a friend" ASAP! HG HEADS UP! There will be NO HG emails this Thursday, Friday or next Monday. Our emails will resume on Tuesday, November 29th.